Their backgrounds and dreams are as unique as you are. What unites them is their creativity, passion, and integrity. 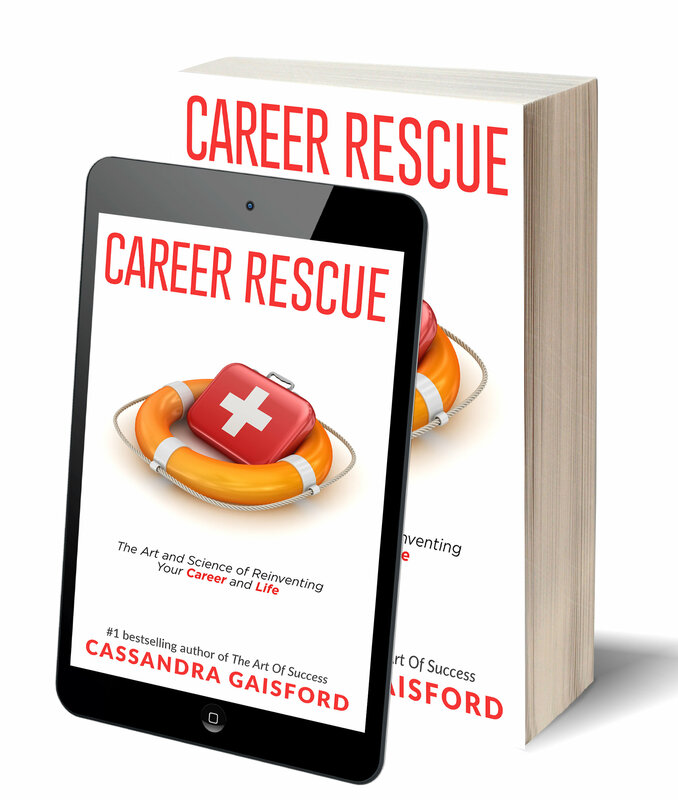 In my latest book Mid-life Career Rescue: Employ Yourself they share their fears, their struggles and their joys as they overcame obstacles and pursued their dreams of self-employment. They shared. They communicated their vision, goals, and plans with those important to them, and they researched their clients and stakeholders constantly to learn how to do things better together. They started smart. When employing others, whether on contract or as salaried staff, they hired the right people for the right job. And, when necessary, they gave their people the training, systems, environment, and recognition to do their job well. They took calculated risks. They always looked before they leaped, but they leaped nonetheless. Courage and confidence were something they built as they went. Leading up to my coaching training I had been working for a major sporting organization for eight years. They were going through massive change and unsettling times. I was up to my fourth restructuring with this company, and management informed us that they were moving the organization to another city. It was an eight-hour drive away, and an expensive place to transport my family to live. I did some investigating and found Cassandra Gaisford and her Worklife Solutions Career and Life Coaching certification program. Her personality, variety of skills and zest for life just really resonated with me. I realized becoming a life coach would allow me the freedom, flexibility, and independence to do work that I loved in an industry that seemed very rewarding and much needed. I knew it would be a steep learning curve, but I love a challenge and felt this was the perfect fit for my interests, skills, and goals. I have always wanted to have my own business doing something I loved. Once I started my coaching training, I felt this was the perfect match for me to be able to utilize my skills and help others to reach their lifestyle, career and wellness goals. I also wanted the freedom to be able to work on new ideas and create my own style by offering a unique service in the Wellness industry through my combination of coaching, art therapy workshops, wellness retreats, Reiki healing, and aromatherapy pamper parties. My initial focus was purely on the lifestyle, career and wellness coaching but realized it would take the time to build my brand, Box of Chocolates, along with gaining trust with clients and networks. I was also interested in gaining a certification in Reiki healing as I felt this would complement my coaching and retreats/workshops, which then led me becoming an aromatherapy consultant too. I also knew that there were not many people holding retreats that offered a unique Zen and creative style that my program offers – you have to think outside the box and run with it! I went along to lots of Wellness industry events, seminars, network meetings and got a feel for what people were needing and built my strategies around that. To read more of Lisa’s story, be inspired by other entrepreneurs, and gain practical strategies to help you plan your beautiful business, purchase your copy of Mid-life Career Rescue: Employ Yourself TODAY! Mid-life Career Rescue: Employ Yourself is available in paper back and e-Book version from Amazon. 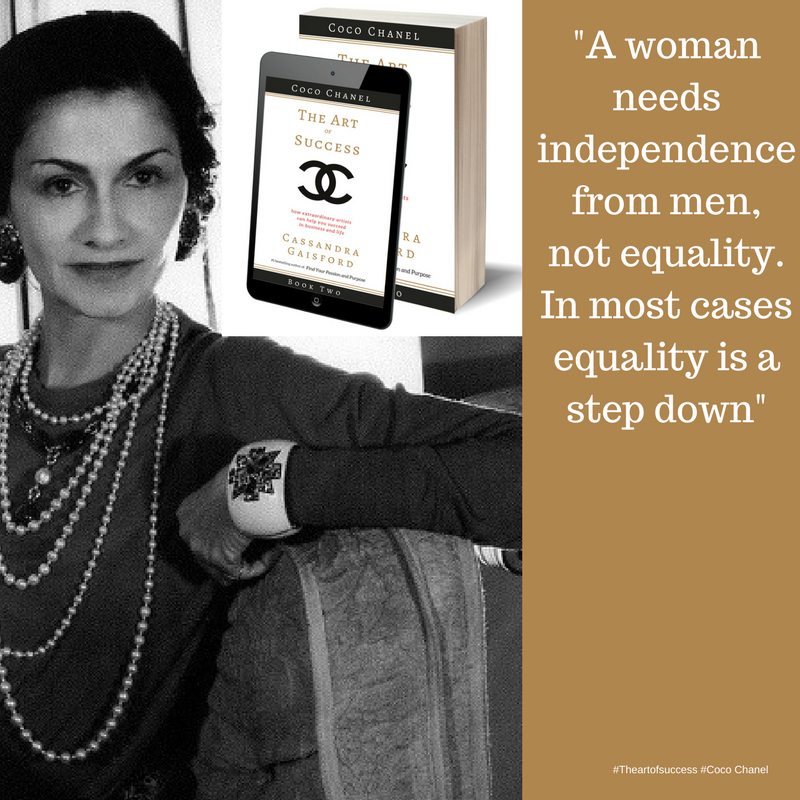 Much of Coco Chanel’s success can be attributed to her faith in the stars. Chanel believed in astrology. She was a Leo, symbolized by the lion, queen of the beasts, Leo is the sign of royalty. Proud and arrogant, yet loyal and brave, this sign if ablaze with warmth and fire. Creative entrepreneurship is the true stamp of a Leo—and Chanel manifested this in buckets. Driven by passion, purpose, determination, a desire to lead not follow, the courage and fearlessness of a lion, and a serious need to be noticed. Making an impression is Priority One for many Leo’s—think Mick Jagger, Arnold Schwarzenegger, Julia Child and other flamboyant people who share Coco Chanel’s sun. Chanel’s moon was in Pisces, making her intuitive to the point of being psychic, writes Karen Karbo in The Gospel According to Coco Chanel. This may explain her uncanny knack for predicting where best to place her energy to amass a great following and fortune. Leo is also the fifth sign of the zodiac—a number Coco used to astounding success when she named her perfume, Chanel No. 5. She also leveraged off her faith in her stars and other spiritual tools to empower her mind, and sustain her during periods of darkness. Marianne knows personally and professionally. You can read more of her story in Mid-Life Career Rescue: What Makes You Happy—including how she started her own business by using her faith in the stars. Google ‘best careers’ for Snakes and I’m told to avoid careers where I have to work too hard. ‘Working hard’ to me is doing something I dislike, working with people I don’t respect. Working hard is not marching to my own beat. But when I’m working in the passion zone, fulfilling my purpose, now that’s a different story. Whether you’re a believer in the notion that whatever planets align at your time and place of birth can determine your intrinsic strengths, shape your character, relationships and fortunes, there’s plenty of helpful data to aid you in your quest for success. Keep an open mind and don’t take everything as total gospel. Go cosmic—gain additional insight about your astrological sign from any of the plethora of books, online resources and personal astrologers. Focus on identifying your strengths, Achilles heel, and best-fit-factors career-wise and in your personal life. by Cassandra Gaisford. To order a copy for less than the price of coffee and cake click here to go to your online bookshop. 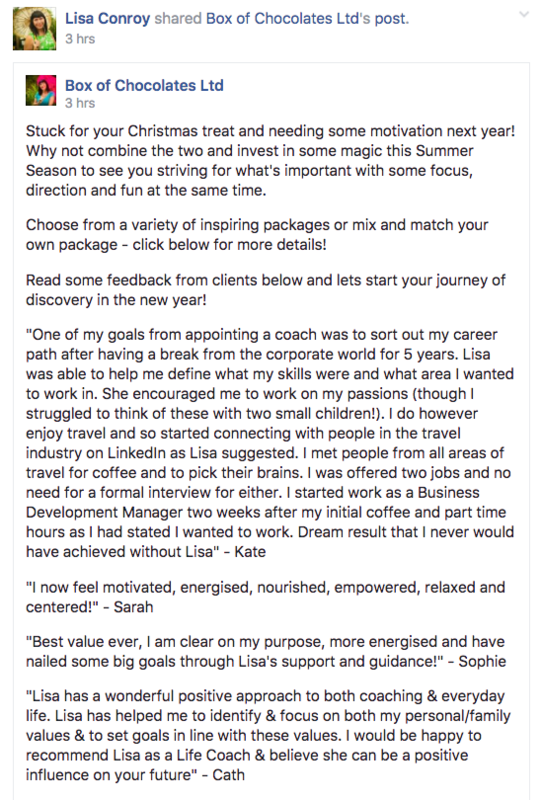 What amazing feedback one of my client’s Lisa Conroy received! Incredible! So proud of her – living and working as she does with passion and purpose! Her success story is just one of many that have enriched my life this year – I’m thankful that having trained her to become a life coach that I have been able to play a small part in her success. Lisa proves that when you follow your bliss, life really can be a wonderful Box of Chocolates. Check out the feedback below. As we near year end, it’s a great time to celebrate your wins, lick a few wounds, and resolve to create an extra-ordinary future. The chances are high that you’re a lot like me—I didn’t inherit a fortune, I’ve had more than my share of challenges, and like waves in a storm, there’s always more hurdles to surf. But successful people, like Coco Chanel and Leonardo da Vinci, and the guy on the street corner praying he can make his mortgage, we keep swimming against the tide of mediocrity. So take a moment, recollect, note and recall all the things you’ve achieved, all the dreams you’ve dared to dream, all the trials you’ve weathered—and most of all celebrate just how fabulous you are. Like the lady who wrote to me (below) and reminded herself she already was successful—she has a wonderful husband, beautiful children….and a kind and generous heart. Fortune favors the kind…and the audacious! Are you looking for more inspiration or the ultimate Christmas gift? Many people have asked me how to I define success? Below is a range of responses from my The Art of Success Questionnaire. Do you notice any key themes? Are any success triggers for you? Living creatively, i.e. making a living off of my creativity, always learning and growing, new experiences and opportunities. Love of family and friends. How do I define success? Success is finished books! Living a creative, soulful life with the freedom to live my life as I choose, doing something that inspires myself and others. And success is also living a life of no regrets. “I thought I was learning to live: I was only learning to die,” Leonardo da Vinci once said. He valued wisdom, understanding and freedom of thought, through the pursuit of knowledge gained from his own experience. Leonardo worked and lived with passion and purpose—following his own curiosities to serving and benefit humanity and to share his knowledge with others. And to live, and die, knowing he had lead a significant life. “I want to create miracles,” he once wrote. And what a miraculous life of significance he led. Leonardo pursued his visionary principles unto his death, documenting all that he learned to benefit the lives of others. In the process he failed, and failed again. He faced the wrath, scorn and jealously of others. He faced poverty, grief and loss. And at times suffered extreme self-doubt and despair. But he never departed from his course. 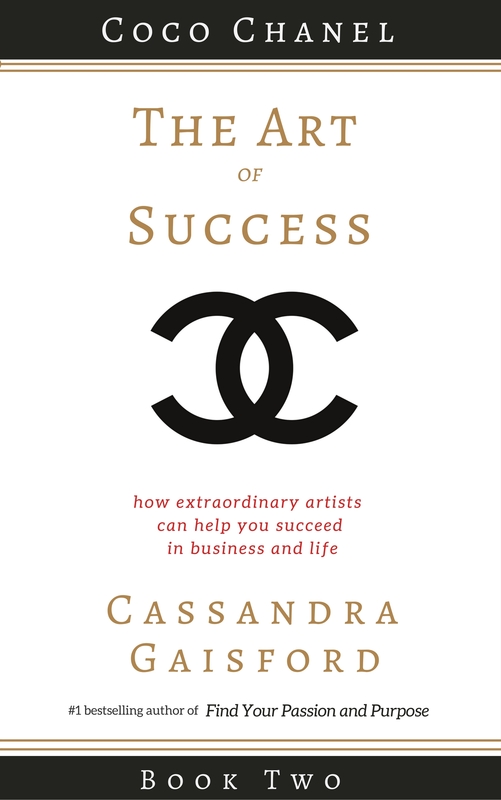 I’ve found the insights people have shared super helpful as I wrote my book The Art of Success. It’s nearly ready to send out to my advance readers, before going to the editor and then to print.